The breeze, the sound of the waves, the smell of saltpetre, the posidonia, the stunning turquoise of the Mediterranean; add to this the bohemian ambience surrounding it and the elegance, serenity and cheerfulness of the people. 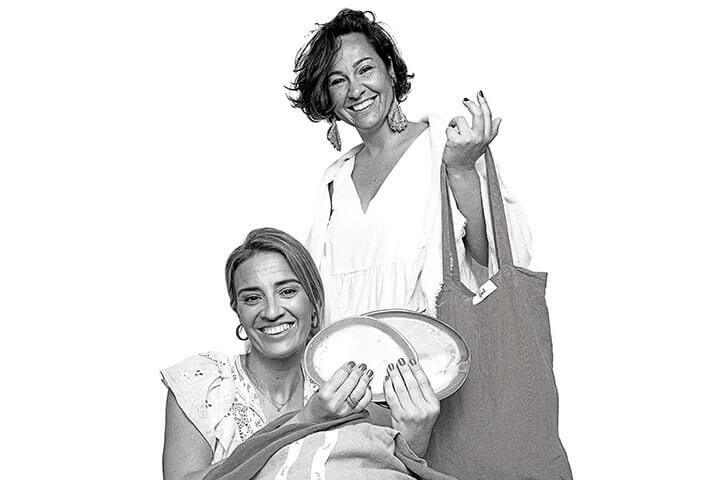 This is what inspired Elsa and Begoña to launch Bemed: a personal dream project that they themselves describe as something which far transcends their brand, which is more of a philosophy of life drawing on the enormous love that both women feel for the Mediterranean Sea. These two friends (one Portuguese and the other Spanish) both acknowledge that they are genuinely besotted with Formentera: they adore its temperate, crystal-clear sea, its scents, its characteristic design and décor, and the island’s lifestyle with its subtle vintage appeal. Out of their affection for the smaller of the Pitiusan islands and the Mediterranean arose Bemed, their joint project dedicated to the design of decorative pieces, kitchenware and accessories to give the table—or any other area of a home, business or restaurant—an authentic bohemian, Mediterranean look. Such is their devotion to the island and its sea, that they chose the posidonia (a plant that grows beneath the waters of the Mediterranean) as the distinctive symbol of their brand. 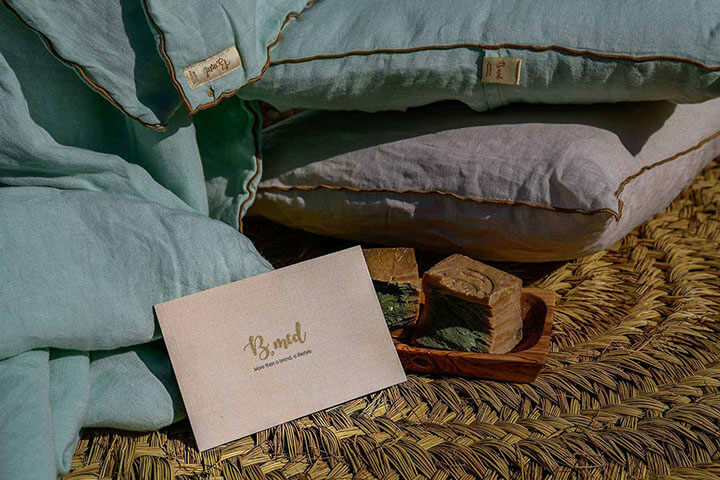 Bemed offers an exclusive range of home textiles, kitchenware and decorative items which reflects the huge variety of the colour palette of the Mediterranean coast. Tablecloths, plates, glasses, vases, containers, flatware, cushion covers, wooden objects, rugs, baskets… Elsa and Begoña have created a whole range of products intended to make any public or private space as pleasant and comfortable as possible—and with a style strongly evocative of the Mediterranean lifestyle that inspired it. Each of their products, whatever the colour or texture, bears this hallmark style, resulting in a unique decorative range with an always-evolving personality. Looking at their collection of objects and accessories, it is not difficult to picture scenes of deserted beaches, long summer evenings, sunsets and, most of all, that pleasant sensation that sweeps over all of us during the holidays. More than the product itself, it is their character and their infectious drive to instill this inspiring mood in others what motivates these two entrepreneurs to take forward this project to create and market decorative pieces. The new brand’s products are proof that craftsmanship and design can finally go hand in hand. Without sacrificing anything in terms of convenience or the highest standards of quality, the brand created by these women is suffused with a strong awareness of the needs of sustainable tourism and the need to protect the Mediterranean ecosystem. Bemed is a responsible business, committed to the care of the environment, using only 100% pure, organic materials and a completely artisan production system. It is their personal way of giving back to their beloved Mediterranean all that it has given them. Their products achieve a perfect balance between elegance and the bohemian style, a look that people fall in love with, and which is carving out a special niche for itself all over the world. Though launched only recently, the firm looks set to become a flagship brand in its sector. To this end, it is careful to use only raw materials of the very highest quality: glass, wood, stoneware, ceramics and wicker for its decorative pieces, and materials such as linen, cotton, wool, silk and satin for its textile lines. Each of these “made-in-house” products reflects the overall personality of the company. 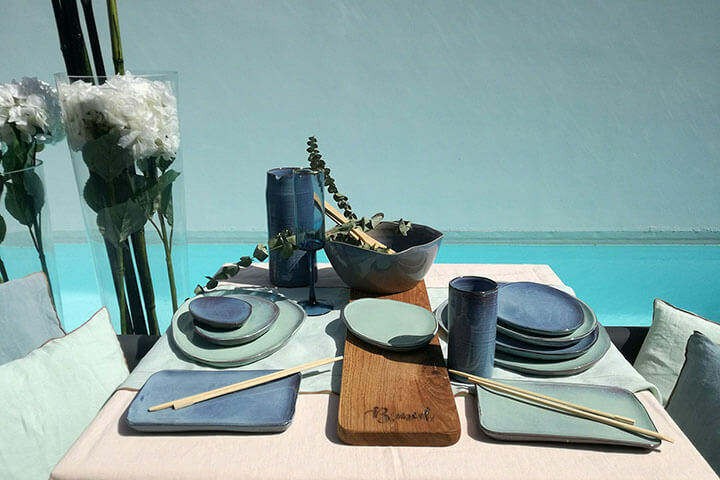 Elsa and Begoña only work with limited, custom-made collections, which are designed and produced using artisan methods in Portugal, one of the world’s most prestigious centres for the home textile industry. At present, Bemed uses two marketing methods: wholesale marketing, and their exclusive bespoke channel. As far as bespoke sales are concerned, the company develops specially-made products and complete collections with exclusive finishes for hotel chains, restaurants, lounges and yachts all over the world, adapting to the needs and particular tastes of each customer. They custom-make their textile products in different colours, with a variety of trims and finishes, and do the same with their wood and ceramic ranges. In terms of wholesale supply, Bemed’s collection is now available in several countries through showrooms, interior design shops and, of course, through the brand’s website: www.bemediterranea.com. Portuguese and Spanish styles complement one another in this venture recently launched by Elsa and Begoña—under the watchful eye of their Mediterranean muses, who lend it soul, truth and a distinctive personality, and who inspire the founders of the business with their immense creative freedom.